Bo got a Big Nasty Surprise yesterday on the Little Red River. 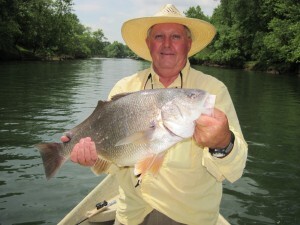 This 12 pound freshwater Drum is certainly a rare catch on the river. It may have come all the way from the Mississippi River, up the White River and into the Little Red River. It was taken on a T-3 Orvis 6wt. fly rod, 250 sink tip fly line and a size #6 “Chuck’s Chunk” streamer. 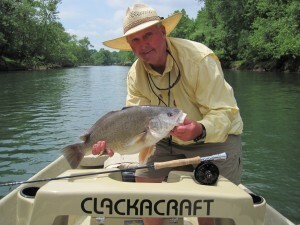 The fly is the design of Chuck Farneth, the winner of the first ESPN Great Outdoor Games Fly Fishing Competition, and Chuck was in the drift boat with us yesterday. Book a trip with us at Empty Creel Fly Fishing Guides and Outfitter and see what surprise awaits you on the Little Red River.